At St. Michael’s Parish Day School, children are loved and valued. In our warm and creative environment, your child will grow spiritually in our regular chapel services designed for children, and creatively in the classroom, in our garden and on the playground, and through special events and field trips. He will learn to cooperate, solve problems, create, listen, and to respect others and respect differences. St. Michael’s promotes the growth of the total individual by helping each child develop socially, cognitively, physically, and emotionally. Our child-centered program includes both teacher-directed and self-selected activities, quiet and active experiences, and the recognition that learning occurs in both formal and informal ways. 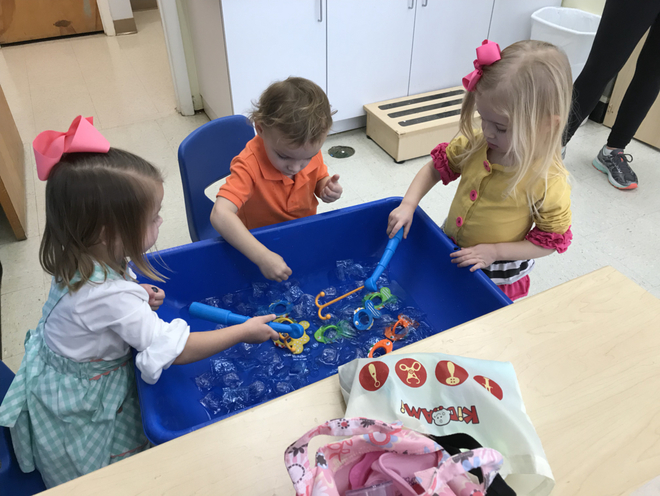 Because young children learn best through active participation, teachers provide every child with many “hands-on” activities. The staff at St. Michael’s works as a team to meet children’s needs, with support from the church and its members, the St. Michael’s Parish Day School Committee, parents, and the community. The Day School will host an Open House for parents of prospective Pre-K (4-year-old) and Kindergarten (5-year-old) children on Wednesday, Jan. 9, at 7:30 p.m. in the church's Convocation Room. Parents will meet the teachers, tour the classrooms and hear a short presentation about our Pre-K and Kindergarten curriculum. St. Michael's Parish Day School will hold registration for the 2019-20 school year beginning Monday, Jan. 14, 2019. We offer half-day classes for ages 6 months-5 years. Current students and their siblings should register during the week of Jan. 14-18. New families (including new church members, siblings of former students, and the general public) may apply January 22-25. Children will be placed in classes using a lottery system, and families will be notified by Feb. 1 whether children have been accepted or waitlisted. To apply, please turn in a registration form (available on the Day School website beginning January 7) and the registration fee of $175 per child. The Day School is pleased to announce the addition of a Kindergarten (5 year old) class for the 2019-20 school year. The class will meet from 9:15 a.m.-1:15 p.m. Monday through Friday, and the curriculum will be based on kindergarten standards set forth by the NC Department of Public Instruction. All other Day School classes (ages 6 month-Pre-K) will meet from 9:15 a.m.-12:45 p.m. For more information or to schedule a tour, please contact Mandy Annunziata, Parish Day School director. Lead teachers have been working at the Day School an average of 11 years and have an average of 16 years of experience teaching preschool. All teachers have college degrees and are required to participate in 5-10 hours of educational workshop training each school year. Our active Parent Council provides support to the director and teachers, sponsors special events throughout the year, and raises funds for special purchases for the school. Membership is open to all parents of St. Michael’s Parish Day School students. Our curriculum centers around a learning-through-play concept. Our teachers incorporate developmentally-appropriate resources in classrooms, including LetterLand, S.T.E.M. projects and Handwriting Without Tears. Day School teachers practice a Conscious Discipline-based approach when working with students to encourage confidence, independence and respect for oneself and others. We are one of the only preschools in our area with a chapel designed specifically for children, and we have a music/movement teacher on staff. Small class sizes and low teacher-student ratios give teachers plenty of time to work one-on-one or in small groups with children. Teachers share information with families through home visits, parent conferences, email, newsletters, and classroom websites. We also provide Triple P services for Day School parents who have questions about common childhood challenging behaviors. For more information about Triple P, click here. Mandy grew up in Danville, Va. She received a B.A. in Psychology and a Certificate in Human Development from Duke University and a M.S. in Family and Child Development from Auburn University. She also is certified as a Triple P (Positive Parenting Program) Level 2 provider. She and her husband, Gene, have lived in Apex since 1997. This is her 22nd year at St. Michael’s as the preschool director. She and Gene have two boys, Matthew (18) and Jacob (15). Mandy loves reading and attending her sons’ sporting events. They cheer for the Duke Blue Devils and Carolina Hurricanes! Cason grew up in eastern North Carolina and now calls Raleigh home. After graduating from the University of North Carolina at Chapel Hill with a BSBA, she began her career as an investment banking analyst in Greenwich, Connecticut. In 2005, Cason moved back to North Carolina and assumed a financial advisory position with Edward Jones Investments. She is a member of Christ Church, where she recently served as assistant treasurer, then treasurer for the ECW. Cason and her husband John (a fellow Tar Heel and former Day School student) married in 2007. They have three children: Anna Prather (8), Bosley (6) and Margaret, (4).